Jiu jitsu doesn’t just train the body, it also trains the mind. Training the mind takes many years of consistent practice. Last Friday, Pedro jr. talked about the mental states of a true warrior, equanimity, alertness, and readiness. Equanimity means mental calmness under stress. Equanimity also means maintaining mental stability, not over celebrating, nor be overcome with grief; ideally in the center. If the mind entered an extreme emotion, the mind should quickly try to get back to center. A palm tree, flexible in a hurricane. Alertness. In my own words, perception of reality, freeing the mind of chatter and distraction. Clearly observing the opponent in front of you. Observing the environment your in. In an attack situation, being able to evaluating the options based upon immediate observation. Sparring, knowledging what the arms and legs are doing. Readiness. Train.Train..Train… Repetition equals muscle memory. 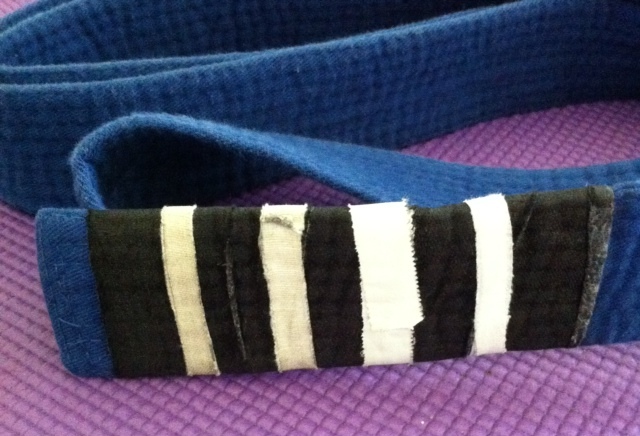 There are ways outside of jiu jitsu where you can improve your mental states. Equanimity, alertness, and readiness can be developed by consistent yoga practice. Yoga means union of the mind and body. Finding the right yoga studio is a problem. Stay away from big gyms that treat yoga like an aerobics class. That I don’t recommend. I recommend the study of the eight levels of yoga called The Eight Limbs. If the yoga studio never heard of this, eight limbs, don’t return. Find another place. Meditation classes can also be helpful to jiu jitsu students. Finding a good meditation teacher isn’t easy as well. I recommend the study of the Eight Fold Path of Buddha. It’s really scientific and not religious. It’s similar to the eight limbs. Neither the eight limbs nor the eight fold path will contradict your beliefs but improve it. I’m not going to give more information because it’s something you need to research and worthwhile. Maybe your ready or maybe not? Take the time to see for yourself. ” The stand your ground law was criticized after Zimmerman fatally shot 17-year-old Martin in the Orlando suburb of Sanford. Zimmerman, who claimed he was defending himself, was acquitted of second-degree murder in July. Days later protesters demanding changes to the stand your ground law began a 31-day sit-in at the Capitol. Smith voted against the 2005 bill that created the law, and said that he still believes people should be required to retreat first, if possible, before using force against an attacker. But he said he worked with Simmons on areas where they can agree. Both senators attended hearings around the state to discuss the law. Simmons said he wanted the bill to also clarify a provision of that law that states it doesn’t apply in cases where illegal activity is occurring. Simmons says that the language is intended to keep drug dealers or others committing crimes from using the defense, but some people are interpreting it too broadly. • This article is from the Miami Herald dated October 8, 2013. For purpose of education and information only.